A collaborative effort between MacKenzie’s Investment, Industrial, and Capital teams has led to the sale of 1954 Halethorpe Farms Road, a 680,000 square foot industrial building located in the Baltimore-Washington Corridor. Owned by Halethorpe Business Trust, the building was purchased by Blue Ocean Realty, a growing regional firm. The sales team consisted of Michael Spedden, Vice President and Don Schline, Senior Vice President/Principal of MacKenzie Commercial Real Estate Services, LLC and capital advisory services were provide by John Black, President of MacKenzie Capital Company, LLC. The building is currently 100% leased to seven tenants. Lead tenant Alcoa, a global leader in lightweight metal technology, engineering, and manufacturing and the world’s third largest producer of aluminum, occupies 55% of the building. “This sale further validates the continued strength of the industrial market within the Baltimore Washington region,” stated Michael Spedden, Vice President. The building played an important role in American military history. 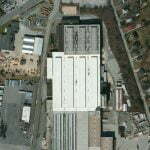 Former owners include the US Government (DoD), Halethorpe Extrusions, and Kaiser Aluminum and Chemical Company. Kaiser worked closely with the United States Air Force in the manufacturing and assembly of various aluminum parts used in military aircraft. Some of the existing German-made heavy presses are rumored to have been sent to the United States after World War II as part of Germany’s war reparations. “The recent renewal of the ALCOA lease, exceptional ceiling heights, and the Corridor location were attractive to a number of regional and institutional bidders,” said Don Schline, Senior Vice President/Principal. “With this acquisition, Blue Ocean has obtained instant market scale as they continue to grow their industrial portfolio,” added Schline. For additional information on MacKenzie’s investment services, please contact Michael Spedden at 410.494.6644 or mspedden@mackenziecommercial.com or Don Schline at 410.494.6648 or dschline@mackenziecommercial.com. For capital advisory services, contact John Black at 410.494.6652 or jblack@mackenziecommercial.com. For inquiries regarding MacKenzie’s full service offerings, visit www.mackenziecommercial.com.